Bonnie Fishburn keeps us updated on her progress at the British Riding Clubs National Finals and also heads for an equestrian training holiday in Portugal! “When I last spoke to you I was thrilled to pieces having just done my second BE Novice on Percy and Florence, that seems such a long time ago now. My first piece of good news from September was that Frankie had his final scan and the vet was pleased with how his recovery had gone, so he was allowed to go out in the field, awesome news for Frankie who had been stuck in the stable since June! The first weekend in September, Mum and I made the long journey to Lincoln for the British Riding Clubs National Championships, along with Florence, Percy, Betty Boo and Dolly Doo. We had qualified for 5 classes in total. It was a hectic day chopping and changing between horses, tack, rings and classes. Florence was in 4 classes, so had to do two dressage tests and jump 3 showjumping rounds, she felt quite tired before we started, so she was shattered by the end of the day. I think with the journey up there and only having done a BE Novice 6 days before she was feeling the pressure. But Florence always tries her best. First she jumped in the Intermediate Showjumping, She popped a clear in the first round but had 4 faults in the second round. The Nantwich Team finished 10th. Next was the Novice 30 dressage which she scored 65.77% in and which was good enough for 5th individually and the Nantwich Team were 1st and National Champions for the Open Dressage. Poor Florence missed out on that prize giving for this and collecting her rug and sash because I was jumping Percy at the time, so took him in because I hadn’t got time to swap them over. Florence then had to do the Novice Riding Test, which she did impeccably but the judge wasn’t on our side and we finished just outside the placings with 72.27%, the Nantwich team were 2nd. And finally for Florence was the Style jumping, she popped round easily but again we were just outside the placings individually but the Nantwich team were 6th. Percy had to fill his big brothers boots from last year and took on the Open Showjumping, which he did in fine style. Jumping clear in the first round and having an unfortunate 4 faults in the second round. We were placed 6th as a team for Nantwich. It was a very long day followed by a 3 hour drive home but it was all worth it and the Nantwich Riding Club had brilliant results as a whole, with lots of new National Championship titles to add to their successes. And we got our picture in Horse & Hound a week later! My last event of the season was at Kelsall Hill Horse Trials and it is safe to say it is not my greatest weekend on record!!! A very early start with Florence and Percy for the BE100 on Saturday. Percy was up first and did what I thought was a very nice test but in quite a harshly marked section the judge didn’t agree for a 36.5. He then jumped a super clear Showjumping. He was flying Xc right up until the corner, where we had a really silly glance off. So very annoying right at the end of our season and very unlike him, but it was the bogey fence and did cause several run outs, but no excuse, we should know better. Then my day got worse. Florence was doing what I would consider a lovely dressage test when all of a sudden the pair of us hit the deck. We both shot up and I jumped back on and carried on like nothing had happened, hoping the judge blinked and missed us, but no such luck, we scored a big fat 0 for that particular movement, I thought we gambolled in fine style and should have been given at least a 9! Once we were dusted off we headed to the Showjumping. 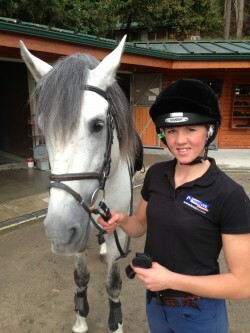 Florence was very excited to be in Kelsall Hill’s very smart arena and flew round in a really jolly frame of mind. She jumped fab but picked up an unlucky 4 faults for a fence down, quite unlike her. And then the Xc, again she was flying right up until the stupid corner, where I’d changed my approach to it a little after my glance off on Percy, but still didn’t get the right line and had another glance off. I should have just gone the long route. Useless jockey needs sacking! So not a great end to the event season for my two homebreds but we live to fight another day. When my alarm went off at 4am I should have just rolled over and ignored it! I had qualified Florence and Percy for the British Showjumping Amateur Second Round, so I took them to Southview at the beginning of October. 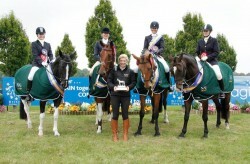 They had both qualified in the 95cm class. Both jumped impeccable double clears to finish 10th and 11th, not often Percy beats his sister but I rode Florence with the handbrake on because I knew she just needed a clear in the jump off to qualify for the Amateur Championships at Aintree because the top 12 qualify and we were second last to jump and the 4 faulters were in 11th and 12th spots. Job done. Two qualifications. It does mean though that their holiday will be cut short this winter as the champs is in November, when they are usually still be on holiday. So they will have a few weeks off, then come back into work in November and then possibly have another short holiday after Aintree. Florence had one last duty to do before she had her holiday, we were invited to ride the guinea pig test for the CCI* J at Weston Park International Horse Trials. This, if you don’t already know, is the very first person to ride the test in front of the judges before the actual competitors start. Great excuse to dust off the top hat and tails!!! 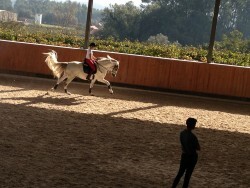 Florence had never been ridden in such a big posh arena and never in top hat & tails either. The weather was absolutely awful and it rained from the time we got there until we left. But Florence was such a good girl and didn’t get fazed by any off the surroundings. I was really pleased with how she went in the test although I didn’t really ask for the medium canter on the 20m circles because with the wet conditions and no shoes on, I didn’t want us to fall in a heap like two weeks previously!! So that means that everybody is done and dusted for the 2014 event season, my three horses are out on their brief holidays and will be back in work come November to get ready for the British Showjumping Amateur Championships at Aintree, but that doesn’t mean my adventures finish there….